One of my friends asked… can you do something at the winery for Mothers whose kids live far away? Then I got to thinking about my family. One of my best memories with my daughter was enjoying a glass of wine with her and some of her friends… and THEN they started telling stories. Yea, the ones that were better heard years later. I don’t think I’ve laughed that hard in a long time. The winery is a Gathering Place. If your children won’t be with you this weekend, then stop in. If you’re wanting to treat your Mom or Grandmother, then stop in. 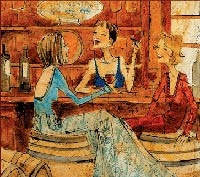 If you want just some time to yourself with your girlfriends, then stop in. If your family wants to take you out, then stop in. Spend some time in what we call the Girl Friend corner… besides the bar… it’s the other place in the winery where laughter rings out and the barn smiles. Update… Just talked to Molly. We have a menu for the “noshing”. It starts with crème puffs and M&Ms… and goes on from there.